Greetings to you in this month of October, the month dedicated and consecrated to Our Lady of the Rosary. Since many of you have asked that we include in our newsletters information about prayer, sacramentals and other spiritual topics, we thought this would be a fine opportunity to speak of the Holy Rosary and its value in our life. Who can better teach us than the Church herself, speaking through Christ’s vicar? Click here to read about what various popes since the 16th century have taught and counseled regarding this favorite prayer of Our Blessed Mother. Did you know that you are under the Holy Virgin’s special protection just by holding or carrying the blessed rosary in your pocket? You may gain an indulgence of 100 days for doing just this. How many of us have not been consoled and comforted in the trials of our lives by the praying of the rosary? How many of us have not known the soothing of our grief at the passing of a loved one when we pray the rosary at that sad hour? In times of temptation, in times of danger, has not Our Blessed Mother brought calm and hope for victory through her rosary? In the days of our childhood, we receive our first rosary, often on our First Holy Communion Day; and at life’s end, is it not the last object placed in our hands as we return to God? It has been our privilege over these many years to make this precious sacramental for thousands of the children of Mary. As we make these rosaries, we endeavor to pray for the person who will use it. We have also been blessed to receive rosaries to repair that are over 150 years old! And when we touch these old treasured beads, sometimes badly broken and battered from age and years of use, we think of other times and other children of Mary, now long gone, who while they prayed with this rosary, were perhaps enduring the ravages of the Civil War… Our Heavenly Mother is Mother of every age, every joy, every sorrow and triumph. Let us pray with grateful hearts the “Crown of Roses” she herself has bestowed, returning love for love to this tender Mother! In our August newsletter, we announced our offering of Father Lasance’s My Prayer Book: Happiness in Goodness. The overwhelming response and interest in this book is proof to us of the real yearning of the faithful to grow in the life of prayer. Please consider this treasure as you choose gifts for your family and friends – and for yourself! You will not be disappointed! Colorado autumn is upon us, with our aspens turning gold! Our new vocations are thriving in their new life dedicated to God and His Holy Mother. Adjusting to less sleep, a diet of no meat, seven hours of formal prayer throughout each day (Divine Office and mental prayer) and a little stiffness in the knees from kneeling more, they are finding the life both joyous and challenging. We are beginning to make the Carmelite habit for our youngest Sister, whose clothing ceremony will be in January. We still await the arrival of one young lady currently studying in Paris. Various complications have caused delays, but we have good hope that she will enter before November. At this time, we are corresponding with young ladies from Michigan, California, Colombia, and Brazil, so the future definitely holds promise for more growth, but we have no more room in our Monastery! 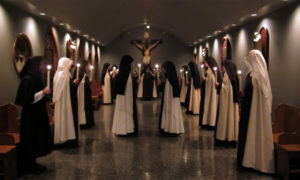 We must expand our convent so that these ladies can fulfill the vocation to which God is calling them. hank you again for shopping our website. This is indeed another way to support our Carmel and help with our building project. We have added many new items, including gifts for Christmas, like nativity sets and ornaments. Is it too early to shop for Christmas cards? We thought perhaps so, until we recently sold over 50 sets in just two weeks! We are pleased to offer these lovely and unique Christmas cards, printed in Italy, currently 5 different styles. As well, you will see that we have added a number of pieces of sacred art, especially of the Madonna and Child. Included among these is the wonderful and varied selection of sterling silver plaques and easels, crafted in a new technique developed by Italian sterling silver artists, represented by Salerni and Della Fonte. Our best photography efforts fall a little short at reproducing the beauty of these pieces in our website pictures. They are both exquisite and devotional: perfect gifts for weddings, anniversaries, First Communion Day, Confirmation – any occasion!